During the first two months of your baby’s life, amazing things happened in the parts of the brain related to touch, crying, eating, hearing and sight. During the four months following that (2-6 months) you will notice that the parts of the brain related to hearing, touching and seeing are still very active. Indeed, the parts in the brain that play a role in language and movement have now become highly active. The parts in the brain that were very active up to this period (crying and feeding) is now at a more ‘normal’ level of activity. In other words, they are not as overly active as they were. They are just getting on with their jobs and will continue to do so for a lifetime. 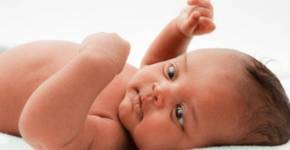 During this period, your baby is taking the leap of patterns, smooth transitions and events. The part of the brain that deals with touch remains active, but differently than before. A baby continues to get great comfort and positive feelings from loving physical contact, but babies will now also start touching things themselves. From the time that your baby starts to use their hands and feet (even before they consciously grab them, or ‘accidently’ encounter something), they learn that things feel differently when they touch them to when they are being touched. They also learn to feel the difference between touching their own face and that of someone else. When you touch your own face, the brain registers two types of physical contact: the touch of the hand touching something and that of the face itself being touched. You could say that the region in the brain that registers ‘touching’ is responsible for learning the body’s boundaries. What is my body and where does it end? That is a major process of discovery. Touching objects and things in the surroundings greatly contributes to discovering the world. And that is something that your baby is very occupied with right now. The part of the brain responsible for movement is also highly active at this time. You will notice that your baby is moving more by the week and can do more with their body each week. But do beware here lies a pitfall! Put simply, in order to be physically capable of doing something, you need two things: a musculoskeletal system and the brain. The muscles and bones must be able to perform the physical skill; they have to be strong enough. The brain needs to be able to register the movements and direct the muscles. If, for instance, the brain has not yet learned to register ‘balance’ your baby will not be able to do something that requires balance, such as sitting. The brain is the ‘control center’. The part that registers movement is highly active and also undergoes development at specific times. That is precisely what it is happening during the leaps you can read about in “The Wonder Weeks”. It tells you the when and what of your baby’s mental development. In The Wonder Weeks you can also read what your baby will start doing after the leap. There is a list of skills, which the brain, the ‘control center’, is capable of directing. The muscles and bones must be able to do these things too, of course… and they do not develop at set times. The muscles of one baby are stronger at an earlier stage than of another baby. One baby has heavier bones than the other, and the body is therefore heavier to lift. Now you will understand why in The Wonder Weeks it always lists the earliest possible age at which your baby is capable of doing something. We describe the ages that the brain can cope with something. Whether your baby can actually do that straight away or not depends on their body (their preference). If you watch “The Little Mermaid” fairytale you will instantly notice how important language is to us. You could say that language is essential for feeling comfortable within yourself. After all, it is the easiest way to communicate, and considering humans are social animals, communication is indispensable. During this period, you will hear the first audible babbling and little sounds. Your baby is now busy discovering the world. Seeing things plays a big part in that. It is therefore not surprising that this part of the brain is still overly active. Your baby prefers looking at things that visualize that which they can now perceive after taking the past leap. Just after the leap of patterns (eight weeks after the due date) babies like to look at patterns the most. This is not just the checkered cushion on the sofa, but also things such as the branches of trees contrasting against the sunlit sky. 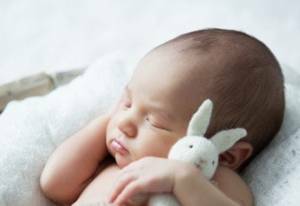 One leap after that (that of smooth transitions), your baby will prefer looking at smooth visual transitions such as a mobile or a light that becomes increasingly brighter when you use the dimmer. When as a parent you know the new things your baby can now perceive for the first time with their brain, you can show them those things in your home and surroundings. You do not need expensive toys to do this, only the knowledge of what interests your baby each leap. So now you understand how important it is for you to know this. The brain is literally screaming for this input because this part of the brain is so active at this time. The reason this part of the brain is still so active now is actually pretty much the same as for sight. You also discover the world through hearing sounds. 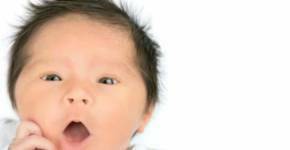 Hearing sounds influences the brain, and not only in babies but also in adults. Calming music calms, upbeat music gives you energy. Music influences your mood. There are theories going around that you can influence the development of a baby’s brain through music, and with classical music in particular. It has never been proven but nor has it been refuted. In other words, it is still believed to be true but it cannot be scientifically substantiated. No more than the opposite theory can: the hypothesis that music with a hard beat could have a negative effect on the brain. One thing everyone agrees on is that thumping house music does not make a baby happier, and that’s putting it mildly. So, don’t put on that type of music if your baby is happy. You do not have to become a Mozart fan overnight, just try out different types of music and see how your baby responds. Due to their brain development, your baby is now even capable of indicating what they like and what they do not like, if you pay attention to the signals they are giving you. In The Wonder Weeks you can read everything you need to know about what interests your baby when it comes to perceiving things through sight, hearing and touching. In “The Wonder Weeks Online Guide” you learn how to understand the perceptive world of your baby and to experience it yourself.